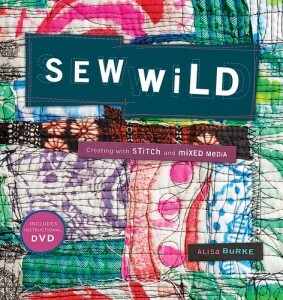 I’ve had fun reading an advance copy of Alisa Burke’s new book , Sew Wild. It’s beautiful and full of great techniques for fabric and more! Now, I have to be honest, I don’t sew. I CAN sew, I CHOOSE not to. I learned how to sew the ‘right’ way and well, that pretty much took all the fun out of it for me. 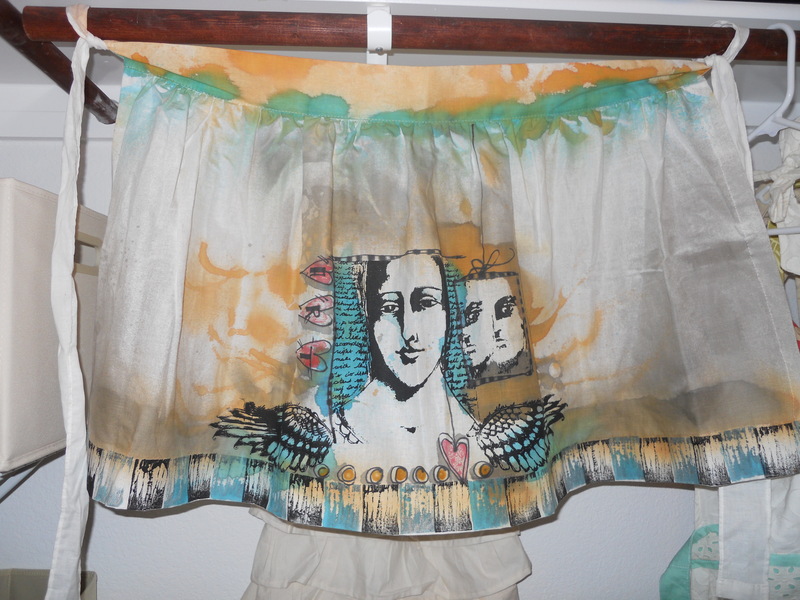 I learned quickly that I’d rather paint so I left sewing behind although my machine is still part of my studio. I did do a stint of sewing on paper that was fun, and when I took my machine in for a cleaning I got reprimanded for it-lol! 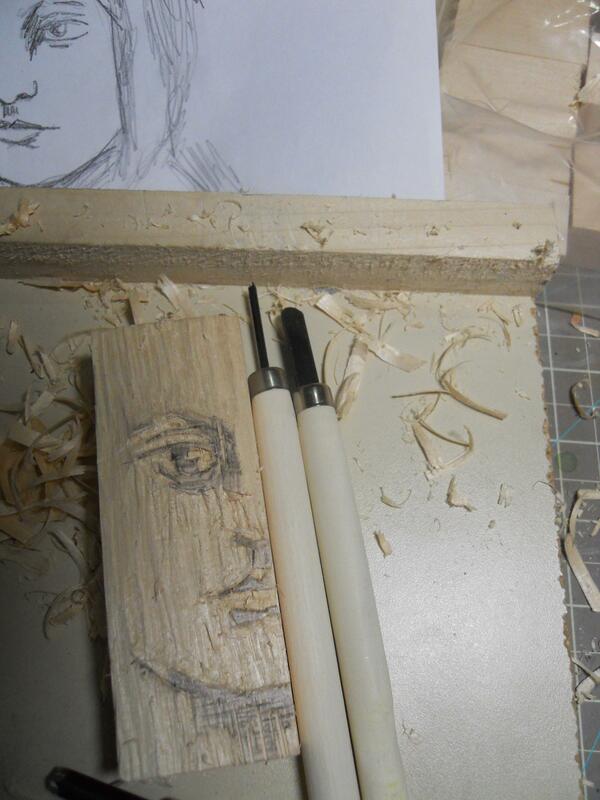 I chose to start with a wood carving project. I’ve never carved on wood and it’s a lot different than lino blocks, but fun and the carvings are very unique looking. I did some simple designs to go along with the face I carved. The carving blocks and even tools can be found at Michael’s. 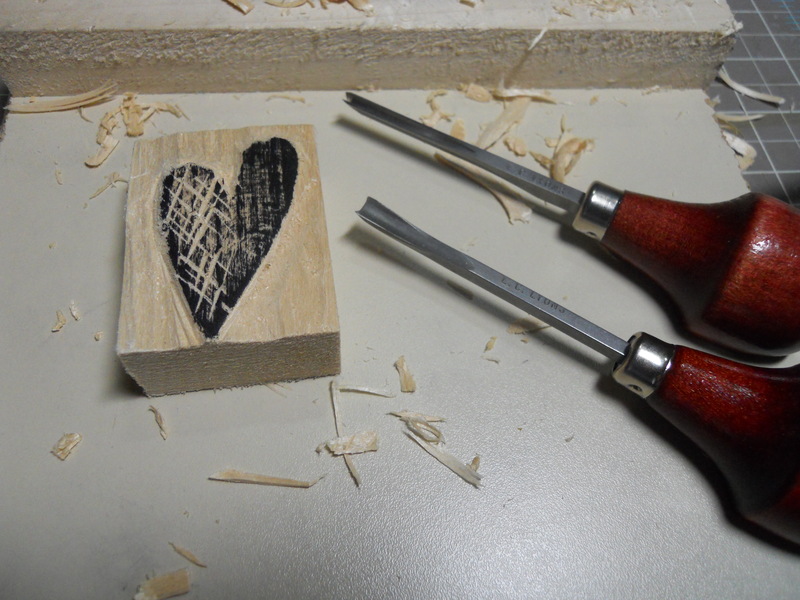 I even used my lino cutters and they worked fine. Now, to get around sewing something I found a cute little ready to decorate muslin apron at Michael’s as well. There is a whole isle of ready to alter clothing etc. Here’s the begining of my apron, with some carved blocks, and thermofax screens. I’m not sure if I’m done yet but loving it so far! Can’t wait to try some other techniques from the book. Be sure to check it out HERE. loev. Love. LOVE the apron!!!!!!!!!! Dear Pam, I want to tell you that I enjoy in your DVD (that I received as a prize at the Artful Gathering) and I am really impressed with the content. You’re a very good teacher and I’ll try your technique 🙂 Thank you very much! OMG! That’s just the greatest thing. You need to be really proud of your work, no kidding. I love that apron, I really do. Looks fantastic Pam, I like your take on sewing as I was the same as you, taught but with a horrible, horrible teacher in school. I am a lefty and got my hands wacked with a ruler, every class, for sewing the “wrong” way. I love what you did with the apron. many years ago. Now I look for the ready mades. 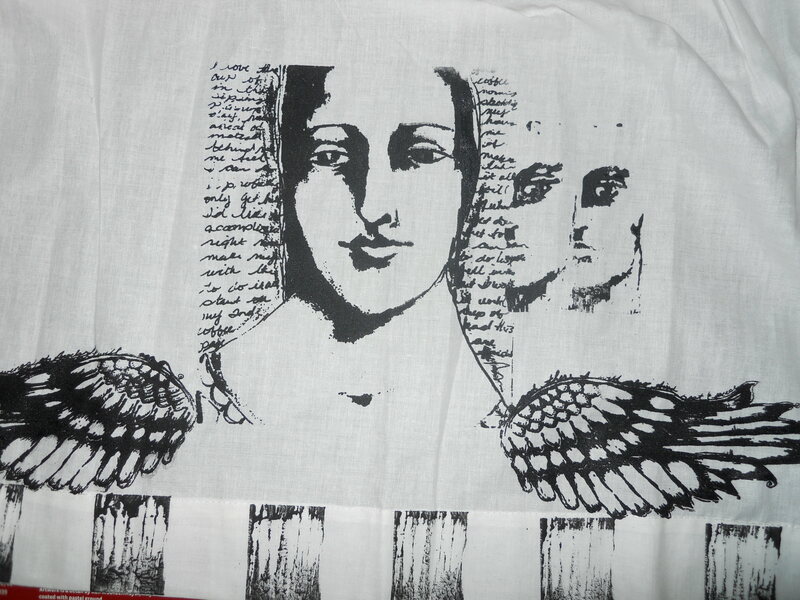 I took Alisa’s painting on fabric class, but have not read the book. Beautiful! I love what you did. You carved wood. What a woman! Love the way you colored the apron. I love Alisa’s work and took a class from her earlier this year. I am not a sewer per se either. I have the book. I swear there is NO wood carving in that book. I must go back through and figure out what I missed as I just quickly leafed thru on the day it arrived. Thanks Pam. That’s so cool. I love your spin on the graffiti images! I can’t wait to actually see the book! Thanks for the review Pam. 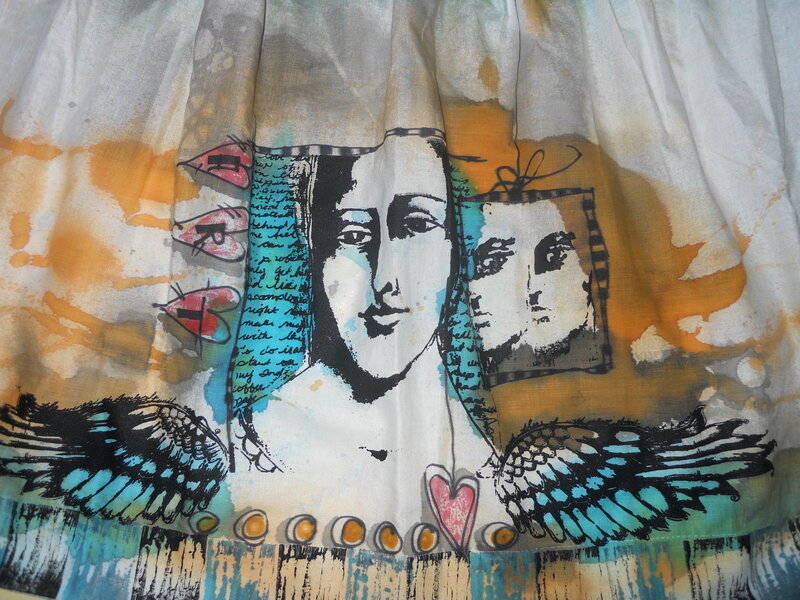 I love your art and I LOVE what you have chosen to do with that apron! WOW! Alisa’s book looks SEW exciting and I can hardly wait to get my hands on it. You have certainly made me want to get the book! Your examples of carving and apron are so awesome. I am stuck on my back right now with muscle spasms, but oh boy, I want to get up and carve and create! It amazes me how quickly you attacked that project and it is beautiful! 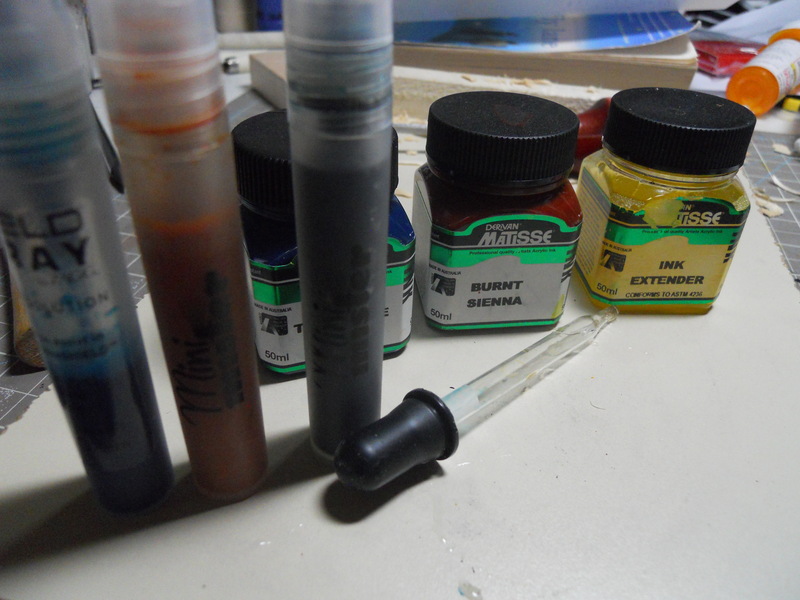 Really love what you did and the colors are really my favorites. I’m in awe.